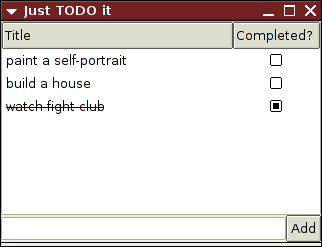 Just TODO It is a lightweight TODO-list manager written using Ruby, Gtk2/GtkBuilder and yaml. Just TODO It's aim is to make it very easy to just pick-up-and-use: start the program, type some tasks, tick some off, no need to learn any other concepts. Only show the user the "next tasks"